Home / Help Desk / How to include all Work Log Comments in Notification on Ticket close mails? In Crow Canyon IT/Facilities/Requests applications, there is a column “Work Log” which is version enabled so all the comments are stored in its own version along with user and time stamp. Out of the box Crow Canyon application’s product app could include only the latest comment entered into this “Work Log” during the ticket close event. This article describes possible work around to include all Work Log versions along with the known limitations. We can configure such that all comments entered by user (#1 above) are included in the notifications by following the steps described in this article but we cannot include system updates (#2 above) with configurations. Create new column “hiddenWorkLog” of type “Multiple lines of text (Enhanced Rich)” in Tickets list. Go to Tickets list settings, create new column with the name and type mentioned above. This column will be used to copy the Work Log entries every time when someone add comments to “Work Log” column. This column won’t be shown on the form but it will be used in the mail templates. Check “Hide Save Button” checkbox under “Layouts and Theme” section. 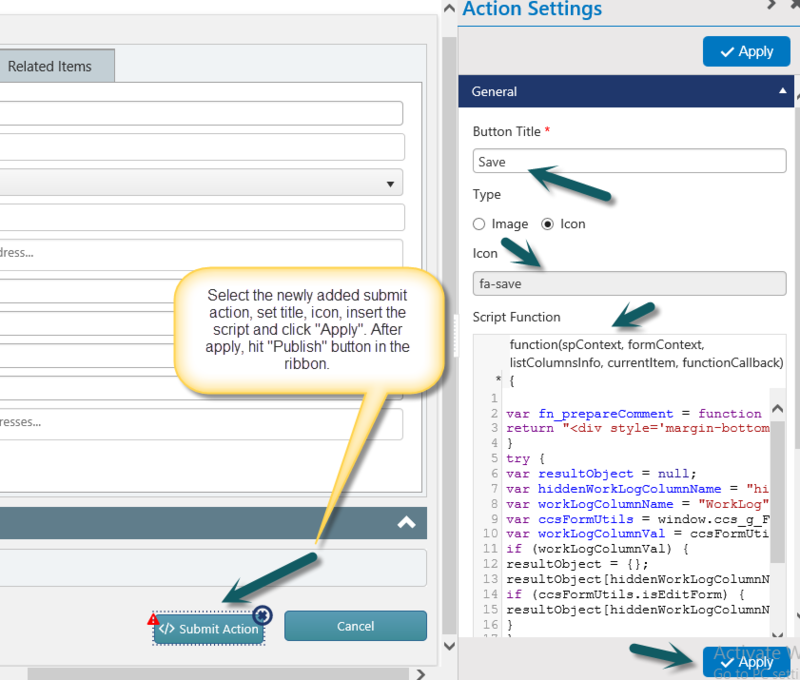 Set the “Bottom Action Panel Button Align” value to “Right” under “Layouts and Theme” section. Repeat above four steps in “Edit Tickets Form” as well. Go to Portal site, Portal Settings, Edit the Tickets list form under “Portal Forms” section, and repeat the steps described in the #2 above. Since Portal tickets list form does not contain the “Work Log” column in the new form, these configurations are required only in edit form. Go to Application Administration, Notifications, click on “Notification on Ticket Completion” tile, replace “<<Work Log>>” column place holder with “<<hiddenWorkLog>>” in “User Mail Body” and “Staff Mail Body” columns and save the item.